Why buy a Camera ? It is of course possible for a big laboratory to make their own neutron cameras. But even the largest laboratories find it convenient to buy such equipment. Although the principles of neutron imaging are simple, there are many details that can only be learned by experience. Frankly it's faster and cheaper to simply buy such basic equipment rather than re-invent it. Eventually it might be modified in-house to serve a particular need, but why not start with an off-the-shelf product that is already used by many others ? We use high volume commercial CCD units, which are inexpensive to repair and replace. the scintillator front end to change the optical path length. This fixed geometry requires no translation components that can fail or malfunction. of the camera box, can be easily shielded, and use simple air cooling. and the camera would be much more complicated, requiring water cooling. amplified 10m extensions up to 30m total. A wide choice of third party software is available for free, as well as an SDK. Neutron cameras are almost as old as neutron diffraction itself, and are simply a variation of the even older photographic techniques used from the discovery of X-rays. Indeed neutron cameras are just X-ray cameras with a component (usually LiF) to convert neutrons into ionising particles and X-rays, which are then converted into light using an X-ray scintillator (usually ZnS). A neutron Polaroid film camera was used with a scintillator from the beginning of ILL in the early 1970's, and even earlier elsewhere. The principles of the neutron or x-ray camera are described by the US National Institute of Science and Technology (NIST) and the PSI laboratory of the Swiss ETH, both of whom are important clients of NeutronOptics. A film is used to record the shadow cast by a semi-transparent object in a beam from a reactor, accelerator or other neutron or x-ray generator. The idea of using a video camera instead of film goes back to Arndt, U.W. & Ambrose, B.K. (1968) in Cambridge (UK) "An Image Intensifier – Television System for the Direct Recording of X-ray Diffraction Patterns", IEEE. Trans. Nucl. Sci. NS-15, 92-94. This was also proposed for neutron detection by Arndt, U.W. & Gilmore, D.J. (1975) "A Neutron Television Camera Detector", Brookhaven Symposia in Biology, 27. VIII 16.-VIII 23. Neutron CCD cameras were then developed at ILL and elsewhere for tomography and other imaging applications. They consisted of the usual neutron scintillator screen reflected in a mirror and imaged by a sensitive lens and camera. An attempt was made by A. Heidemann in the 1990's to replace the ILL Polaroid neutron camera by a CCD camera based on the AUDINE Project. This proved too large for routine use, but a cheaper compact version (pp 85-86) developed by A. Hewat in 2006 was widely adopted. How can an inexpensive Neutron Camera compete ? (This table is from a PSI brochure). 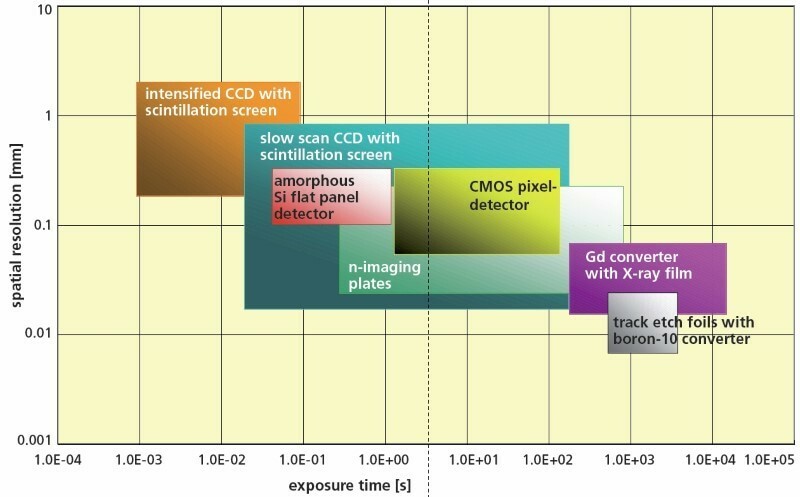 CCD cameras cover most neutron imaging needs (click to enlarge). However, position sensitive neutron detectors are usually expensive. Expensive neutron cameras typically use a large CCD or CMOS chip, perhaps coupled to a photomultiplier or micro-channel plate using a tapered optic-fibre bundle. Clearly such hardware is expensive, so is there a cheaper solution ? The answer is Yes, for many applications. If very fast acquisition is essential, Photon or Electron Multipliers do produce brighter images, but usually with more noise and lower dynamic range. Tapered fibre bundles increase the effective area of the CCD, but unless the scintillator is small, you still need a lens to image it onto that larger area, and modern CCDs are already large enough for most lenses. You can eliminate the optics with flat panel or "pixel" detectors, but then these are eventually damaged by the direct beam. Indeed, slow-scan CCD cameras still cover most neutron imaging needs for large area, high resolution detectors (figure above). We will attempt only to indicate some of the issues without going into detail. Although thermal neutron energies are low (~0.025eV), the energy released by prompt fission following neutron capture by nuclei such as 6Li is high (4.79MeV). The resulting fission products produce as many as 160,000 light photons when absorbed by a scintillator such as ZnS. NeutronOptics cameras use the same neutron scintillators from SCINTACOR and RC-Tritec as much more expensive cameras. The ZnS is doped to emit green light, where our CCD cameras are most efficient. The efficiency of a scintillator increases with its thickness, but resolution decreases. 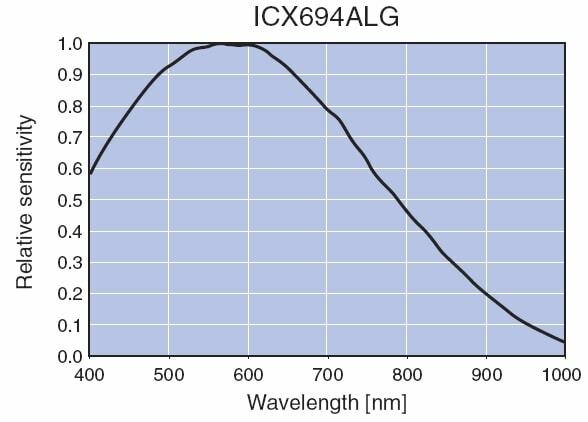 Very thin scintillators can be made from a material such as Gd, which has a much higher cross section, than 6Li, but light output is very much lower than from ZnS. Thin neutron scintilltors are commercially available, though resolution is ultimately limited by the collimation of the neutron beam, and neutron intensity decreases with collimation. The capture efficiency of 6Li and Gd decreases rapidly with increasing energy, so imaging with hot neutrons is difficult without a relatively thick scintillator, which reduces resolution. Hot neutron scintillators are typically 2-3mm thick slabs of Poly-propylene/ZnS (PP/ZnS), where the ionising particles are knock-on protons rather than 6Li fission products. Hot neutron scintillators are also commercially available, but still much less efficient than thermal neutron scintillators. On the other hand, X-rays are converted to visible photons by scintillators containing heavy metal oxides. Much work has been done to increase scintillator efficiency and minimise radiation exposure for medical examinations, so NeutronOptics uses the most sensitive medical scintillators for our x-ray cameras. 1mm aluminium windows are transparent for neutrons, but for x-rays we use 0.5mm carbon fibre windows, with an estimated transmission of >70% even for soft CuKα X-rays (8 KeV). The resolution of consumer CCD cameras has increased dramatically, driven by marketing and consumer demand - at the cost of poor efficiency in low light. But the resolution of a neutron or x-ray camera depends mainly on the resolution of the scintillator, which decreases with thickness, since light is emitted along the capture path. Since the efficiency of a scintillator increases with thickness, thickness is a compromise between resolution and efficiency. Geometric magnification can increase resolution with an x-ray point source, but for neutrons it is difficult to obtain much better than 0.05mm (50µ) even with thin LiF/ZnS scintillators. In special cases, very thin Gd2O2S:Tb screens can be used for higher resolution, but their efficiency is an order of magnitude lower. For very high resolution x-ray imaging, very thin crystals of YAG:Ce and LuAG:Ce can be used. The efficiency with which photons are collected depends on the ratio of the effective area of the CCD, enlarged perhaps by an optic fibre bundle, to the area of the scintillator screen. So smaller screens or larger CCDs have an advantage; a 1/2" CCD is twice as efficient as a common 1/3" CCD. Light gathering power also depends on the f-number of the lens i.e. the ratio of the focal length of the lens to its diameter. Common SLR camera lenses start at f1.4 or more, but since efficiency depends on solid angle, our small camera f1.0 lens is twice as efficient. Large CCD's and large aperture lenses become expensive, and an SLR lens also implies a large camera such as our advanced imaging camera with a 4/3" CCD. Small NeutronOptics cameras use smaller CCDs, so a smaller lens can be used, but still large enough to allow f1.0. The focal length of a small lens can be reduced to 8mm or less, making for a very compact camera. The depth of focus of a large aperture lens is also small, but only the plane of the scintillator need be in focus. For advanced imaging we use large 50mm or 25mm lenses such as the Nikkor 50mm f/1.2. Since the lens-CCD distance can be easily adjusted in our advanced camera, this lens can focus either a 100x100mm screen at 375mm or a 200x200mm screen at 750mm with our 2048x2048 pixel 15.2mm CCD . Since a standard Nikon mount is used, the lens can be readily exchanged to obtain super high resolution (depending on the scintillator and neutron beam collimation) with a macro lens such as the Micro-Nikkor 105mm f/2.8G to image ~50x50mm at 375mm (not tested). Consumer digital cameras often use CMOS sensors, but CCDs are suited to longer exposures (>1s) because they have lower background noise (dark current), especially when they are cooled. We also read out our CCDs slowly (>1s) to minimise readout noise. Consumer cameras use colour CCDs, with filters covering three pixels at each point. Light is absorbed by the filters and less light is collected by smaller pixels. Ordinary cameras use "mega-pixel" CCDs, which are good for resolution, but bad for efficiency because the pixels are tiny. Our high efficiency monochrome CCDs have no filters and a relatively small number of large pixels to maximise light gathering. In our "interline" CCDs, charge accumulated by photo-sensitive columns is quickly transferred to adjacent storage columns. The advantage is that smearing is avoided during readout, so a mechanical shutter is not needed. Some of the chip area is used for storage, but that is compensated by the use of micro-lenses over every pixel. Our Sony "super-HAD" CCDs actually have a second micro-lens for each pixel to maximise light gathering from low f-number lenses, which deliver light at low incident angles. HAD (Hole Accumulation Diode) CCDs use an extra accumulation layer to drain-off thermally generated electrons and reduce thermal noise, most important at low light levels. Otherwise, in our "fullframe" KAF8300 CCD the whole chip is photo-sensitive, so it is suited to very long exposures with very low light, using an internal mechanical shutter. A "scientific" sCMOS chip is a more expensive combination of CCD and CMOS, attempting to take advantage of both techniques. "Back-illuminated" CCDs are a little more efficient at short wavelengths, which tend to be reflected from the front CCD surface, but for the mainly green (540nm) light emitted by neutron scintillators, have little advantage. Finally an EMCCD or "electron multiplying" CCD increases the electronic gain such that "single photon" detection becomes possible. Electron multiplication can be compared to photon multiplication with Micro-Channel Plates (MCPs), but photon multiplication is not needed for most neutron imaging where so many photons are produced for each captured neutron. We can supply EMCCD cameras but simply multiplying the gain does not of course impove neutron counting statistics, and usually reduces the dynamic range. Of the high-end cameras, the PCO.2000 uses the same Kodak KAI-4022 interline CCD as our LF40+ and has similar imaging performance, except that it uses more expensive electronics with faster readout and higher frame rates. The main advantage of the CIS2020 sCMOS camera is the much faster frame rate for lower readout noise (but higher dark current, which limits exposure times). The sCMOS camera is then best suited for fast readout on high flux sources, while our cooled CCD cameras are best suited for lower flux neutron imaging with longer acquisitions (>1s). Our small cameras use Sony EXview HAD CCDs, which are very efficient, with low noise and fast readout, but the chips are also small, limiting light capture but permitting the use of inexpensive fast C-mount lenses. Our f/1.0 lens is twice as fast as an f/1.4 lens. More important than the efficiency of the CCD itself, the efficiency of the camera is proportional to the ratio of the CCD to scintillator area, so our smaller CCDs are matched to our smaller cameras. Resolution is mainly limited by neutron beam collimation and the thickness of the scintillator to ~100µm, and it is a disadvantage to have a high resolution chip with correspondingly small pixels, as in consumer digital cameras. A Kodak report explains When digital cameras need large pixels. A dynamic range of up to 16-bits is provided by our digital cameras, but the effective dynamic range is the ratio of Fullwell capacity to Readout noise, and is always lower than the 16-bit (65,536) readout. Dynamic Range in Decibels (DR)= 20log (Fullwell capacity/Readout noise)dB eg typically DR= 10,000= 80dB. Note that electron- or photon-multiplied cameras, and CMOS cameras, generally have a lower dynamic range eg DR= 1,500= 64dB, and the dynamic range of our 8-bit video camera is only DR= 256= 48dB. A high dynamic range means that contrast between slightly different intensities is better, important for imaging. NeutronOptics cameras use an electronic shutter that allows long exposures, with charge integration in-camera to reduce random electronic noise. Exposures can be several seconds, or even minutes with Peltier cooling. For simple neutron beam alignment it can be convenient to output a standard video signal that can be displayed on an ordinary TV monitor. Our simple video camera electronics therefore scans the integrated CCD image at PAL video rates of 25 frames/second, though the image itself is integrated over n-frames, e.g. with n=250 for a 10 second exposure. Our more recent cameras output a digital signal over an amplified USB-2 cable that can be up to 30m long. "Slow scanning" greatly reduces readout noise, though readout then takes a little longer. In some of these cameras we have an option for faster readout with higher noise, for example the ICX829ALA and ICX825ALA un-cooled cameras can readout in 0.2s. All our cameras are supplied with free software that will run on even the smallest Windows PCs. It will run on even a tablet with only 2GB of memory and simple SSD storage, such as the Lenovo MiiX 310, but more recent mini-PCs or tablets or even a mini PC stick might be used. MacIntosh software is also available for our compact cameras. Amplified USB2 cables of up to 30m provide both power, control and image acquisition with these cameras. Integration with Linux control systems and GigE networks can best be achieved by using SSH and Linux Remote Desktop to control such a mini-computer server running the camera. With our larger Atik imaging cameras you can use Atik Air to control the camera using a simple server, such as a Raspberry Pi, over WiFi or Ethernet to the client PC. You can even control the camera with a stand-alone Raspberry Pi, without the need for a PC (but even a simple PC gives you additional advantages, and is not much more expensive). NeutronOptics cameras are inexpensive, compact, have good efficiency and resolution, and are very easy to use; essentially they are "plug and play". The compact NeutronOptics alignment camera produces reasonable images with 10 second exposures at 104.n.cm-2.sec-1, or only 1 neutron/second per 100µ resolution pixel. For neutron imaging and tomography, where higher sensitivity and dynamic range are needed, NeutronOptics offers advanced imaging cameras that are still relatively inexpensive because they use slow readout electronics. A readout time of a few seconds is not a problem when the acquisition time might be 10-30 seconds, but when faster readout is required, our CCD units can be swapped for a more expensive sCMOS detector.